Here’s a little question for you – did this movie really need to exist? You would be hard pressed to find someone who doesn’t know the story already, but if you’re going to update it, change it up a bit! We already have movies like A Cinderella Story, Ella Enchanted, Pygmalion, and Camp Rock. All of those films take aspects of the Cinderella story but put enough of a twist on it to make it unique. This is basically just a retelling of a story that everybody knows anyway. This film is very visually impressive. The production design and costume design is certainly very strong, while the cinematography is surprisingly good. The bits with the mice feel tacked on, almost like something they have to do because of the animated film. However, there is more time devoted to the stepmother (wonderfully played by Cate Blanchett, who is the highlight of the cast) We also get far more chemistry between Cinderella and her prince than the animated film. The film does hit all the right notes, and tells the story with a few things that work. Cinderella trying on the shoe is a nice twist on the scene, but for me, it’s Cinderella’s last interaction with her stepmother that truly makes this film. 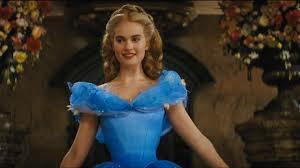 In that respect, one could make an argument that this version of Cinderella surpasses the original. However, you have to take into consideration that the problems of the animated Cinderella can be attributed to the time it was being made, and what was expected of animation. This is the year 2015, and it feels disappointing that the characters still seem stereotypical. Especially coming off of Into The Woods, which was all about taking fairy tale characters and having them all slowly but surely become real people. But there are good moments. Considering what the filmmakers could have done, the film could have ended up being a lot worse. And the performances, directing, and editing are fine, but nothing special. For a film that didn’t really need to exist, Cinderella proves to be an enjoyable experience, and better than it could have been, but I don’t think I’ll be re-watching this one any time soon.